Brian and I celebrated our Christmas yesterday evening. 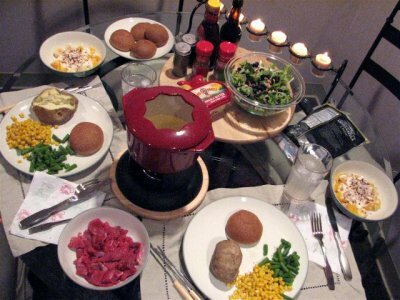 We started out with a tradition carried from my childhood – fondue. This was not a chocolate or cheese fondue, but one where you cook meat in boiling oil; great stuff! After dinner we talked a little then Brian read the Christmas story as we sat by the lighted Christmas tree. At one point he got the giggles because he kept remembering something cute I had done earlier that evening and he could hardly read what the angels said to the shepherds. 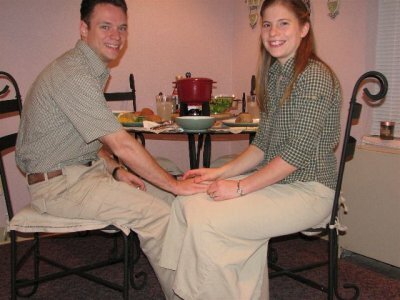 Finally we opened our gifts to each other; Brian wrote me a letter and I had made him some clothes. After talking a little more we ended the evening by playing a game we made up.